I am not artistic in the traditional sense. I cannot put a pencil to a pad of paper and produce beautiful images. I cannot design amazing logos, or paint beautiful sunsets, or sketch realistic animals. If I try and draw something, often the perspective is way out, the eyes are wonky, and the lines don’t match up. I’m not a terrible drawer, but I am not an artist. When it comes to models, however, something lights up. Some part of my brain, which usually refuses to visualise shapes and colours and designs, comes to life. I can build a working merry-go-round out of cardboard, just because one day my brain laid out the pieces in my mind, and I sat down to do it. I can build light-boxes with silhouetted characters brought to life by fairylights and tissue paper. I can make miniature characters out of clay, entire worlds smaller than my thumbnails. There is something so appealing and perfect about miniatures, something which draws me to them, however mundane their purpose. Even a replica of a building in a museum has its appeal, with its tiny windows and delightful little chimney pots. Replicas complete with furniture, with amazingly detailed food or pictures or clothing, have an exquisite charm which captivates me. I could spend hours studying the exact way in which the wicker basket has been woven, or the fire has been detailed to look like real flames. When it comes to creating them, I feel totally engrossed, lost to the rest of the world. An interruption is irritating, even if it’s a pause for tea or water. I want to sit forever, perfecting every miniscule facet of the world I’m creating, so it’s as lifelike and real as it can be. I want to ignore the stiff neck and tired eyes, the fact my foot has fallen asleep under me, just so I can keep building. 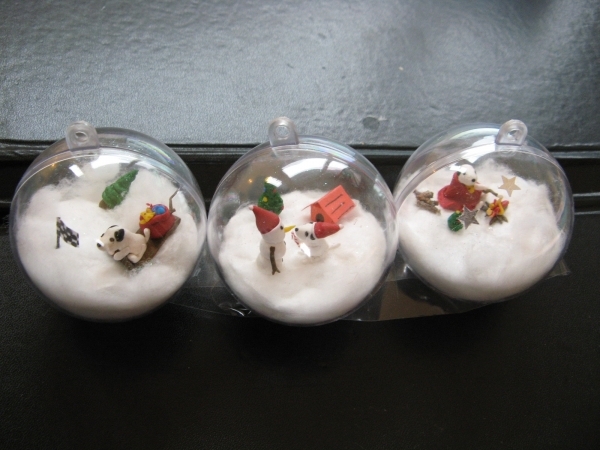 Last Christmas, I gave all the members of my family little baubles with personalised insides: a garden scene with garden tools and a robin; a family sledging with huskies; Snoopy, Woodstock and a snowman; an armchair and pile of books. My cousins got two playful ginger cats; a climbing wall complete with presents and a climber; and an orangutan and sack of presents. They took me days to finish, but I was so thrilled with the end results, and even sold two personalised puppy baubles to another friend. Their completeness, enclosed in a globe of their own, made them perfect to me. There was no work in the creation, despite the hours of time; it was wonderful to try and encapsulate their favourite things into snowglobes. If I could spend my life making miniatures, I would be happy. Ideas come at the oddest moments, when I’m washing up, when I’m halfway through making something else, when I’m trying to sleep at night. Nothing has the same feeling that creating does, nothing makes me happy like sitting back and looking at a project I’ve completed. In all their minute details and thrilling complexities, tiny models spark a passion to pull out the glue sticks and paint, to unleash the glitter, and to create an entire world in the palm of my hand.